It is that time of year again and I am reminded because of the smell and road kill left behind. Plus, a strong scent of skunk has been lingering in the pasture this past week. We used to get them circling the house on winter evenings but our livestock guardian dogs’ presence has kept them at bay the last few years. Their presence is not surprising, however, because it is mating season for skunks and they are on the move. Births announced this week are: Madalynn Kanance Martin, Dec. 11, daughter of Nitosha Pickett and Travis Martin. Rohs Opera House now showing Gran Turino; Coming soon will be Taken with Liam Neeson. Throughout the year one of the most common topics that I receive questions about is growing fruit trees. Oftentimes homeowners have fruit trees that have been in their landscape for many years and they aren’t quite sure how to take care of them. Sometimes homeowners have years where their fruit trees produce little to no fruit at all. Other times individuals are interested in planting fruit trees but they don’t know where to start. Harrison County Go Red Celebration. The annual Go Red Celebration will be held Feb. 21 at the Harrison County Extension Office. The speaker will be Dr. Matthew Shotwell, HMH Cardiologist. The event begins at 5:15 p.m., with the speaker presenting at 6 p.m. A light dinner will be provided, so you Must RSVP by Feb. 20 to 859-235-3510. (StatePoint) Looking to make a change to your nutrition in the new year? Start by examining what is often referred to as the most important meal of the day; breakfast. Here are some fast facts about breakfast from Kelly Springer, MS, RD, CDN, and president of Kelly’s Choice, a collective of registered dietitians, nutritionists and educators that offers customized nutrition coaching programs for schools, workplaces, medical facilities, athletes and individuals. HMH Auxiliary Bake Sale. Feb. 14 - Buy some sweet treats beginning at 10:30 a.m. in the Harrison Memorial Hospital’s Executive Dining Room. Berry City Commission will meet Thursday, Feb. 14 at 7 p.m., at Berry City Hall. The meetings are open to the public. Bingo for Adults. Thursday, Feb. 14 at 11 a.m. at the Cynthiana-Harrison County Public Library. Prizes will be household items. Space is limited. Pre-registration is not required. Participation is on a first come basis. 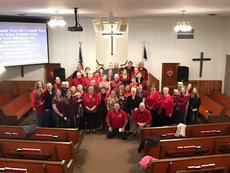 Several churches in Harrison County participated in the "Go Red For Women's Heart Awareness" campaign, by wearing red to Church on Feb. 10. These churches submitted photographs of their congregation members who 'went red' on Sunday. Come Hear! Chris Mashburn-trombone, and Will Lucky and Judy Lucky-trumpets will be playing special music to the glory of the Lord during the Sunday, Feb. 17 service at 11 a.m. at the Episcopal Church of the Advent, 118 N. Walnut St. All are welcome. I’m still thinking about Jonah and the whole swallowed by a fish thing. •Sometimes you’re plankton. You’re minding your own business when all of a sudden a big fish swallows a smaller fish as its lunch and you, the microscopic plankton swimming nearby, get swallowed too.